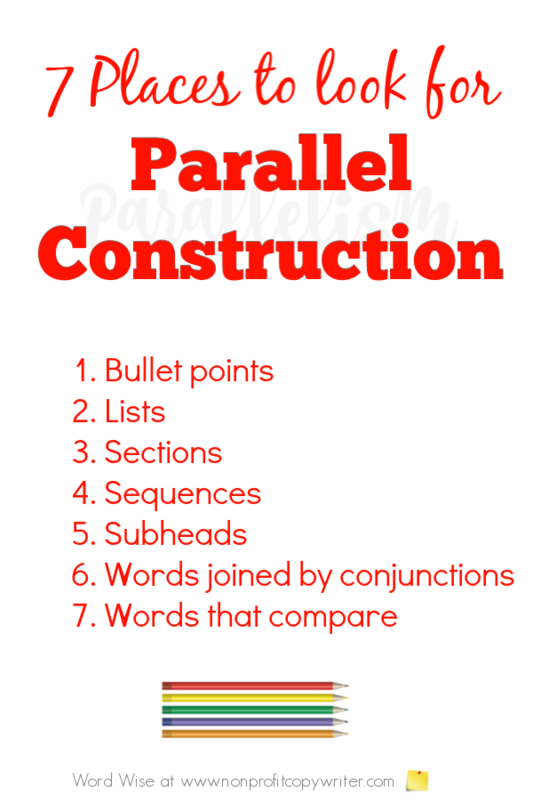 Parallel construction is one of those subtle undercurrents that make for quality content writing. When it’s there, it’s not noticeable. But when your lists or sequences are not parallel, your writing feels awkward or disorganized. Compare it to a typo – an obvious writing boo-boo. Parallelism – not so much. That’s why when you’re self-editing, you want to recognize non-parallel phrases and fix them. Parallelism is a writing device in which grouped phrases are structured the same. Yes, it’s all about grammar. But let’s avoid the grammatical snooze button and get right to the practicalities. You remember studying parallel lines and planes in tenth grade geometry. These are side-by-side objects with the same continuous measurement between them. Likewise, parallel ideas are grouped together in close proximity. And like parallel lines, parallel ideas share a measuring stick: they are written using same part of speech, the same verb tense, or the same subject-verb agreement. Let’s look at an example. Words, phrases or format sentences similarly – they are made to be “parallel” – according to accepted rules of grammar. Words, phrase or sentences are formatted similarly – they are made to be “parallel” – according to accepted rules of grammar. Words, phrases, or sentences are formatted similarly – they are made to be “parallel” – according to accepted rules of grammar. Now that you have an idea about what parallelism is, why bother with it? When your writing is symmetrical, it is easier to understand and process. A list of nouns with a couple of verbs and an adjective thrown in is confusing. Disorganized content reads awkwardly and clouds your point, which distracts your reader. Quality content writing is clear and avoids confusion. Parallel construction is symmetrical and organized. Parallelism follows grammatical word patterns. Patterns add emphasis – they are familiar to the reader, so the reader can organize the content easily in her mind. Repetition and reinforcement drive home a point, which are key elements of persuasive writing. As you self-edit, check these areas to make sure you produce quality content writing using parallelism. Here’s a handy trick for testing your sentence, sequence, or list for parallelism: rewrite the sentence to isolate each element so that it stands alone. Here’s a handy trick for testing your sentence, sequence, or list for parallelism. Here’s a handy trick for testing your sentence for parallelism. Here’s a handy trick for testing your sequence for parallelism. Here’s a handy trick for testing your list for parallelism. Re-write words or phrases into the same part of speech. Re-write verbs into the same form or tense. Re-write phrases into sentences or sentences in phrases. Did you notice all the different places I used parallel construction in this post? Here are a few examples.